Local graphic designer offering logo design, graphic design and illustration in Lake Villa, Illinois. An image that represents how in education the arts can often fall victim to spending cuts. Using social media in schools, schools being connected online, being connected to one another, and unity among different geographic locations. 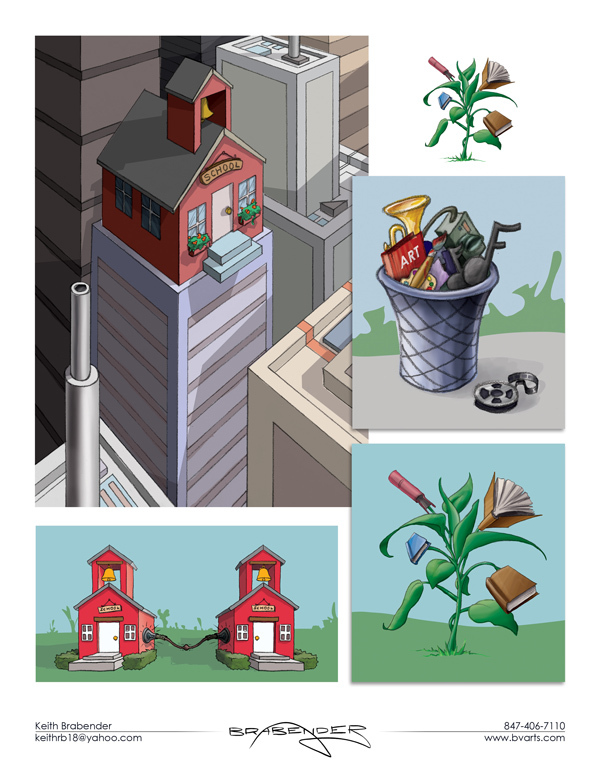 Education in a urban environment, holding on to tradition, school as an island in the busy city, or traditional education vs modern teaching styles. Learning, growing in knowledge, organic learning, and knowledge is or should be accessible to everyone. How do Successful Brands Attract Potential Clients? Brabender Visual Arts a design studio located in Lake Villa, Illinois. We provide business leaders and entrepreneurs the tools and coaching they need to develop their brand.